This course is for a competent tree climber experienced at using the chainsaw on the ground and already holding units 30, 31, 38. 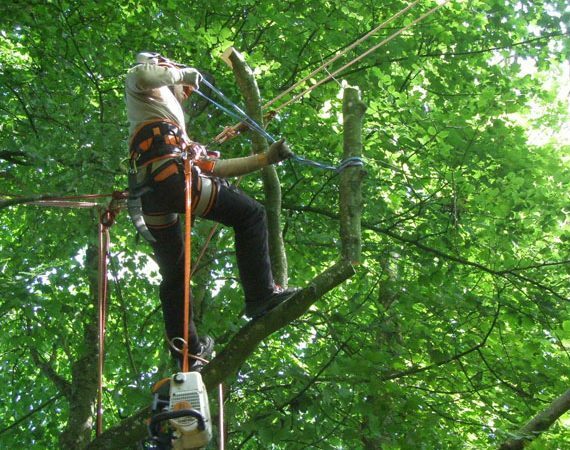 Suitable for professional tree surgeons and arborists. Understand the specific industry legislation and safety guidelines relevant to using a chainsaw from a rope and harness. Successfully identify the hazards and risks associated with the working area. Be able to carry out a basic level hazard evaluation of a tree. Demonstrate techniques for hauling chainsaws into the tree and attaching them appropriately to the harness. Carry out pre-start checks to the chainsaw and demonstrate cold and warm starting techniques. Understand the importance of secure and comfortable work positioning while using a chainsaw from a rope and harness to improve safety and work quality. Be able to explain the basic principles of natural target pruning. Demonstrate the appropriate use of a variety of different cuts including step cuts, sink cuts and natural target pruning cuts. Use top handled or lightweight rear handled chainsaws in a safe and efficient manner to remove light and medium weight branches. This training is in preparation for NPTC assessment (CS39) and typically testing is arranged 1-2 weeks following training. If trainees do not wish to proceed through to testing a LANTRA certificate of attendance is issued following the completion of the training.